Have you been to BAD!SLAM!NO!BISCUIT!? BAD!SLAM!NO!BISCUIT! 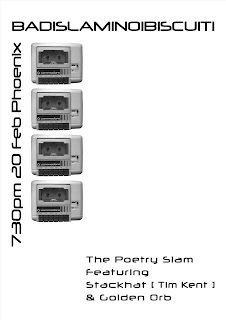 is the poetry slam that wants your words on stage for two minutes for 1st prizes. And to enable this you get one stage, five judges, much sound, many audience, twice the microphone, The Sound Guy, multiple MCs, The Score Adder, very much prize giving, The Master of Conflict, multiplied feature acts, and two minutes on the stage. And this month we bring acts, feature acts! FEATURE ACTS. Feature Act One is STACKHAT [TIM KENT]. Feature Act Two is GOLDEN ORB. 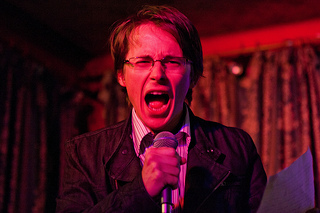 And filling The Hadley Memorial Slots is the poet AK-Pyjamas! So be at BAD!SLAM!NO!BISCUIT! 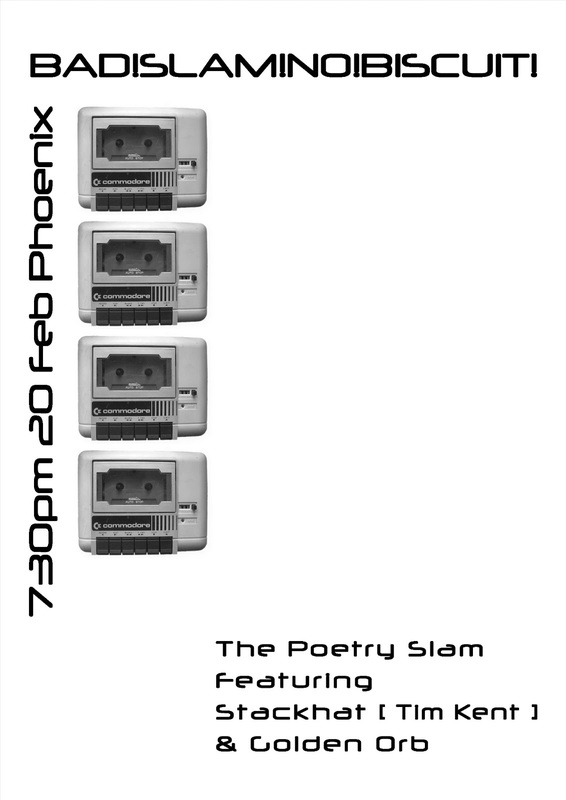 at The Phoenix Pub in the Civic bus interchange, sign-up from 730pm, with your original words, no props, no music, two minutes, for prizes and more prizes.